Fresh off the release of new single "Nice for What," Drake powered up his PlayStation for some more Fortnite action with streaming star Tyler "Ninja" Blevins last night (April 10), during which the pair talked about the growing connection between the wildly popular game and rap stars. During the stream, Drake mentioned that Murda Beatz had recently chopped up the game's current title theme for use in a beat, to which Ninja countered that Drake should write some Fortnite-themed bars for forthcoming new music. "It has to happen, it's just gotta be the right way," Drake replied. "Someone's gonna do it. Someone's gonna pull it off. I say when [Epic Games] gives me the emote, when Epic gives me the 'Hotline Bling' emote, I'll do it. Until then, I'm on strike." 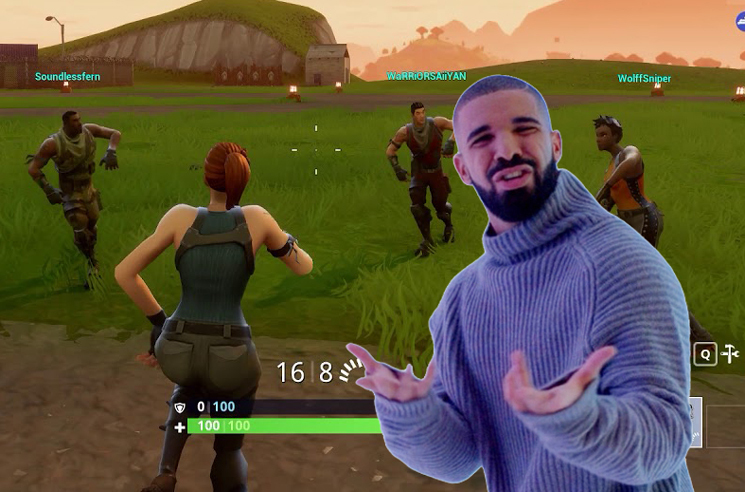 As entertaining as Drake rapping about Fortnite would be, there are a surplus of game-themed raps out there on the web already, ranging from competent to pretty awful. Since the two first got together to shatter a Twitch streaming record, fans of both Fortnite and Drake's music have been asking for the ability to make their characters dance not unlike the rapper did in his iconic video. Drake also suggested that the team at Epic work in Lil Uzi Vert's impeccable shoulder rolls. You can watch the clip from the stream in the player below. Drake's back catalogue is available on vinyl via Umusic, including his albums Views, If You're Reading This It's Too Late, What a Time to Be Alive (with Future) and Take Care.